In DLR’s department for Simulation and Software Technology, a virtual-reality simulation of our solar system is being developed. With sophisticated level-of-detail-algorithms, high resolution digital elevation models and satellite imagery, entire planets and space missions can be explored in real-time. 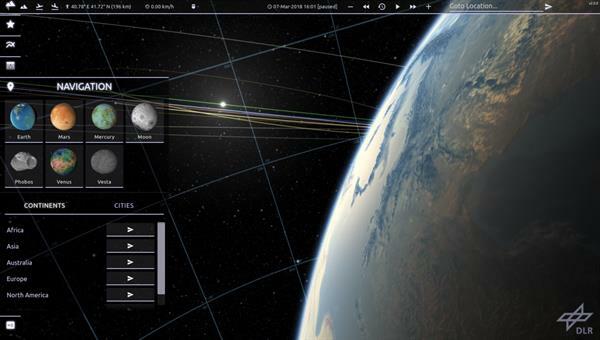 This is not only a simulation of space, but also of time since all celestial bodies are constantly moving on their orbits. When the user decides to use the “auto-pilot” to quickly fly to another location in space (this could be a region on the same planet, on another planet, a moon or a spacecraft) a camera path has to be calculated. On the one hand, this path should avoid intersecting other celestial objects and on the other, rotations and movements should be limited to an absolute minimum in order reduce motion sickness of the user. In the scope of this thesis, this system shall be taken to another level: the travel target may not only be at another location in space, but also in time. That means, while being on Earth in 2018, the user may decide to witness the landing of Curiosity in the Gale Crater of Mars in 2012. Ultimately, this system will allow for the implementation of a “Space Mission Player” where users can seamlessly overserve the different stages of various space missions in time and space. A small user study will be required in order to evaluate the efficiency of different routing algorithms.